Thanks and Congratulations to Green and Fortune! King’s Place is now a landmark in King’s Cross and an important part of Global Generation’s story. This year Green and Fortune, who run all the events and food and drink activities which are the backbone of King’s Place, have just celebrated their 10 year anniversary. John Nugent, one of the two founding directors of Green and Fortune, was one of the first people I met when Global Generation began working in King’s Cross. It was early days; just after Argent got planning permission to develop the King’s Cross Estate. Thanks to Roger Madelin giving us a chance, early on we found a home behind the hoarding. 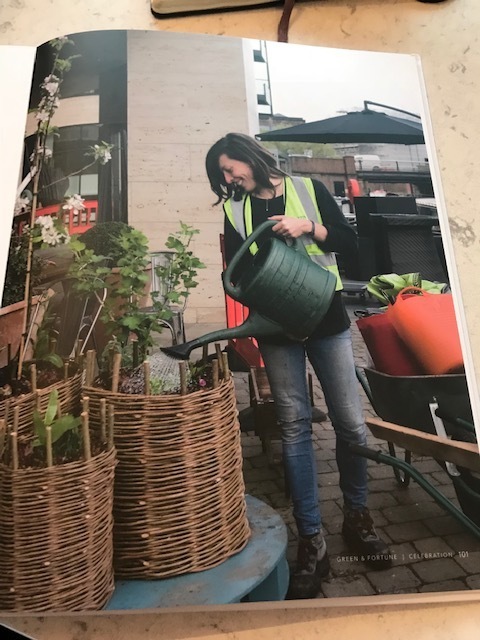 This was to become the first of the Skip Gardens, that have moved and changed as different areas of King’s Cross were built on, and as different people became involved. Growing community has always been the heart of what Global Generation is about. This not only means making things and growing food together but also eating together and that is where John and his team at Rotunda came in. I can remember pitching up to King’s Place in 2008 , explaining that we were building the first Skip Garden with 20 staff from the Guardian, 20 local children and young people and 20 construction workers. I asked for a very large cooking pot for making a shared lunch. I hit the jackpot. Not only did I get a pot but I got the pot filled to the brim with a hearty stew. And in the evening I was back in the Rotunda bar, drinking champagne on the house. That was the beginning of a stream of generosity that has come our way. Young people have sold vegetables to the Rotunda restaurant and done work experience there. John has advised Global Generation on our own Skip Garden café and is now chair of our board of Trustees. As we are a garden it makes sense for us to have a vegetarian menu. However we like to give a rounded picture. A popular event with many of the young people who come on our programmes, has been a tour of Rotunda and a visit to the hanging room. In recent years the relationship has included a social enterprise strand. The Skip Garden team designed, delivered and now tend the planters on the Rotunda Terrace on a commercial basis. We cajole the bar staff to keep up the watering regime and we sympathise with the ducks that choose to nest in the planters. Yet again we find that doing things that make us all stop and listen to the rhythms and patterns of nature is a good way of building community. For Global Generation, Green and Fortune are very much a part of our King’s Cross Community.